← Christa Clips Joins Common Cents Mom Blog! 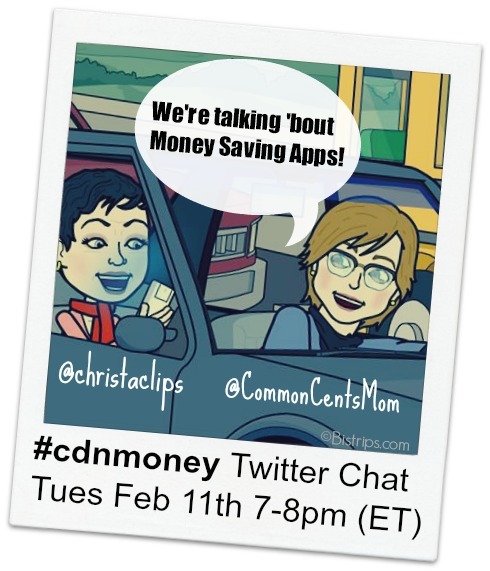 Apps That SAVE you Money on Tonight’s #cdnmoney Twitter Chat! Tonight marks my first night as official co-host of the #cdnmoney Twitter chat! Join Common Cents Mom and I as we facilitate an online interactive discussion about mobile apps that help us to SAVE money! I use the following apps to save on my groceries and household purchases on a weekly basis – learn more about how I combine them to help plan my grocery lists and then earn cash back rebates. If you’ve never attended a twitter party or twitter chat before, check out Hollie’s “How To Attend a Twitter Chat” blog post. I prefer TweetChat as my platform, you can use this link to follow the #cdnmoney twitter chat and tweet along with us! Everyone is welcome – these weekly chats are full of practical information that you can apply immediately to help you SAVE money! Hope to see you at the #cdnmoney twitter chat! Posted on February 11, 2014, in #cdnmoney Twitter Chat, Christa Clips, Common Cents Mom, Couponing and tagged #cdnmoney Twitter Chat, Christa Clips, Common Cents Mom, mobile apps to save money on groceries. Bookmark the permalink. Leave a comment.